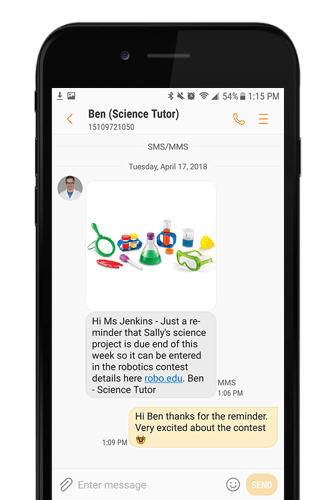 Businesses that offer children’s or adults’ classes whether it is arts, music, karate or tutoring can use Textellent to keep in touch with customers regarding class schedules, instructors, homework, project deadlines and more. Sending out video tutorials to help reinforce lesson plans and reminders about class requirements can help make the educational experience richer and ensure students are prepared. Sending congratulatory notes, birthday greetings and holiday greetings make students feel more appreciated and develop stronger customer engagement and in turn increase referrals. All these programs lead to higher student retention rates, new student sign-up rate, engagement, and satisfaction, thereby making a difference to your business’ bottom line. Texting has really improved how we service our customers and manage our classes . It allows us to be more responsive to customer questions, concerns while promoting our programs. In the end it is all about keeping our customers happy!